ArcGIS helps identify neighborhoods lacking easy access to parks. Inequality of access to parks among children 0 to 15 years old is revealed by GIS. GIS proximity analysis is a strong tool for cities and counties to leverage park accessibility policies. The significance of parks and recreational facilities was recognized and linked to social life and health in the past century. Since then, cities began to preserve land for parks and recreation. The city of San Antonio is being investigated in this study for its offering of adequate neighborhood parks. The ease of access to neighborhood parks is said to be impacted by two aspects: first, the spatial distribution of these parks throughout the city, and second, the concern of public health matters. First, the inequality of spatial distribution of amenities in society is not only pervasive but also long-standing. Second, public health aspects are validated by abundant research relating the greater proximity of neighborhood parks to higher physical activity in young children. This subject also resonates with the Let’s Move program commenced by First Lady Michelle Obama. Neighborhood parks are essential in improving public health, especially for children; their impact, though, depends on the accessibility, safety, and services these parks provide. A neighborhood park serves the local community and its nearby neighborhoods. Typically, it includes basic amenities such as small playgrounds for young children, a number of casual seating areas, and walking and jogging trails. In Texas, the City of San Antonio added a more definitive classification for the neighborhood parks that encompasses only parks with a size restriction ranging from 3 to 10 acres. Moreover, the city has recognized that these parks should easily be accessed with nonvehicular means by all residents in the neighborhood. In 2004, the City of San Antonio developed a strategic plan for parks and recreation for the period from 2005 to 2015, wherein input from the public was accommodated. ArcGIS for Desktop, through an Esri university site license, was used to conduct all the study analyses. GIS was used to generate a map of the neighborhood associations with children between 0 and 15 years old being more than 25 percent of the entire population in each neighborhood. Parks data was based on information from the City of San Antonio GIS department. ArcGIS was used to select those parks conforming to San Antonio’s restricted size for a neighborhood’s park. ArcGIS proximity analysis enabled the creation of a walkable buffer of 10 minutes, which corresponds to a walking range of half a mile around each park. A two-mile biking buffer was also created around each park. Desired neighborhoods were mapped based on neighborhood association information published by the City of San Antonio. Half-mile ranges were preferred for pedestrian accessibility because, on average, it takes 10 minutes to cover half a mile for healthy people—reasonable for incorporating recreational activities into a daily routine. Similarly, for a proper biking distance, a two-mile range is covered in less than 10 minutes at an average speed of 12 miles per hour. 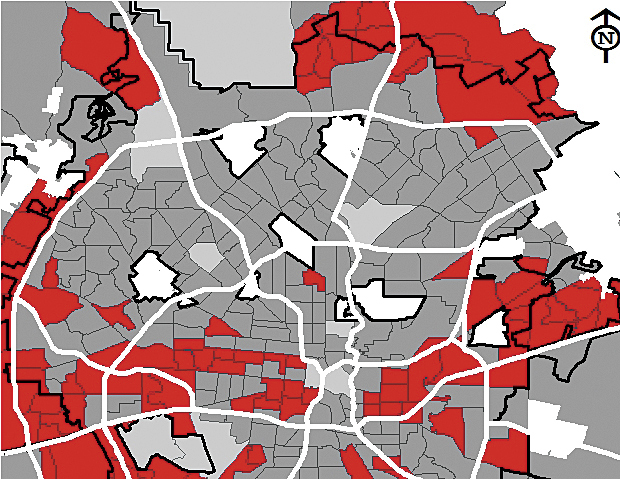 Analysis was started by identifying the areas within the boundaries of San Antonio neighborhood associations with at least 25 percent of their population between 0 and 15 years old. Data from 2012 census tracts within each neighborhood for Bexar County, where the city of San Antonio is located, was utilized. Additional qualitative methods were used in this study, such as observation, to highlight the amenities in each park. Accordingly, the study showed that multiple areas with more than 25 percent of their population being children between 0 and 15 years old have a fair pedestrian accessibility to their neighborhood parks. Most neighborhoods are located within a two-mile biking range to the neighborhood park, but they don’t offer safe and feasible biking lanes. The study concluded that more investigation is needed for the biking routes, and more amenities need to be installed in neighborhood parks. Shubhangi Jangam is a graduate student in the master’s in urban and regional planning program in the College of Architecture at the University of Texas, San Antonio. Dr. Azza Kamal is a senior lecturer on architecture and urban planning in the College of Architecture at the University of Texas, San Antonio, and an affiliate with the Center for Urban and Regional Planning Research at the same college. For more information, contact Shubhangi Jangam.